We have focused initially on the kitchen. 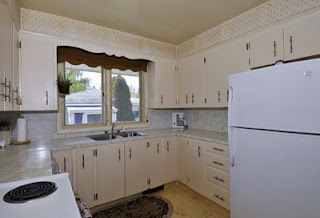 It is where we spend most of our time and is almost totally original: original faux marble formica counters, chrome oven fan, wooden cabinets with original hardware and the wallpaper. Oh yes, the wallpaper. The floors were changed out to (bad) brown floral linoleum in the 1970s (see above). We changed the floor out immediately when we moved in. I have dreamed (in a totally dorky way that one dreams of flooring) of having marmoleum since I first saw it in an abandoned 1930s rooming house at an old psychiatric care facility in Coquitlam, BC (true story). I loved the colours, the pattern and when I did some research, found out that it is as environmental as it gets! Yippee! We found what we were looking for at Deerfoot Carpet & Flooring (We heart Corrine) on 12th Street SE in Calgary. 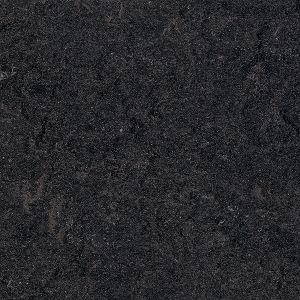 We went with Armstrong Marmorette Commercial Flooring with NaturCote in Obsidian, a rich, luxurious dark gray. They installed it that week. This was our first rehabilitation project (replacing with a period appropriate product when original is not known). We didn’t know what the original kitchen flooring was so went with a product that was popular in the 1950s but selected a colour that is modern and suits our taste. And the results? Ooo La la (scroll down for results). Next on the agenda was to replace the 'oh so lovely' grease-ridden appliances that didn’t work. Need a reminder? For some reason, we selected all Samsung appliances in stainless steel. All from Sears. The stove is pretty cool and actually has a setting for Kosher cooking. A Jewish stove. Nifty! While the girls and I were in Vancouver, we hired painters (the lovely guys at Harding’s Painting - highly recommended) to refinish our cupboards in white. We replaced the door hardware with more a more streamlined chrome design from Handles and More in the NE. A reminder of the original hardware. A tad ornate for my style. Jason is smiling here because I finally chose some handles. We were 'cupboardless' for weeks and it drove him nuts. Mason jar and bottle (from antique store in Cranbrook) inspiration for ceiling and glass tile colour. Vases from Crate & Barrel. Antique fruit stand. Real lemons. Yes, that IS my hand going underneath the formica. Apparently this formica pattern was only made in Canada.